Composers: Shakira - Carlinhos Brown - Jay Singh - Lukasz Gottwald - Mathieu Jomphe-Lepine - Max Martin - Henry Walter - Raelene Arreguin - John J. Conte, Jr.
(P) 2016 Wati-B under exclusive license to Sony Music Entertainment; 2016, 2017 Sony Music Entertainment US Latin LLC; 2016, 2017 Ace Entertainment S.ar.l. (P) 2014 Ace Entertainment S.ar.l. (P) 2005 Sony Music Entertainment (Holland) B.V.
(P) 2004 Sony Music Entertainment (Holland) B.V. 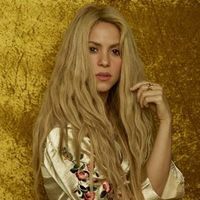 Writer: Shakira Mebarak R. / Composers: Shakira Mebarak R.
(P) 1998 Sony Music Entertainment (Colombia) S.A.
(P) 1997 Sony Music Entertainment (Colombia) S.A.
(P) 1995 Sony Music Entertainment (Colombia) S.A.